The Household of Rausumea is a voting Chapter of Belegarth (since 2003) located in Medina, Ohio. Practices & Battles are held at Memorial Park on Wednesdays 5:30 until Dark. Rausumean history is generaly divided into Generations. Generations often mark major changes in organization of growth of the group. Rausumea forms it's rootes from an underground club that formed in Medina Sr High School in Ohio around 1994. The group was run by a man named Gabriel of Mirkwood - [Sam Potter] and had many members including most of the original founding members of Rausumea. 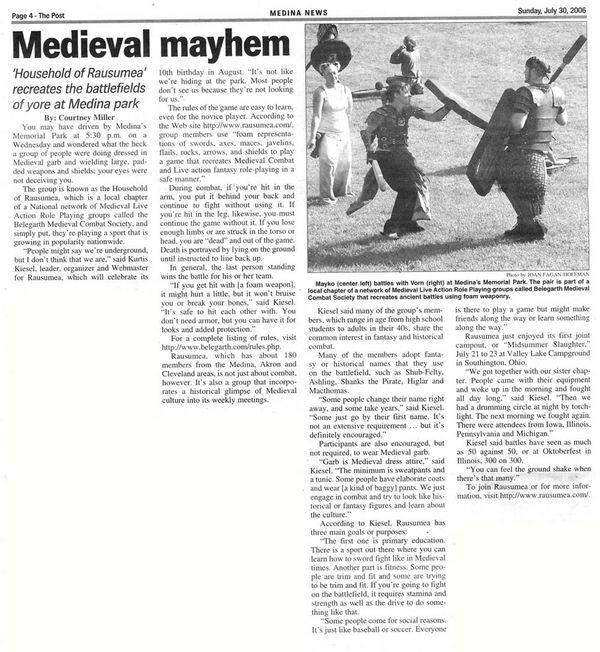 The group was called The Gathering and played a sword fighting game based off of the popular television seriese and movie Highlander. 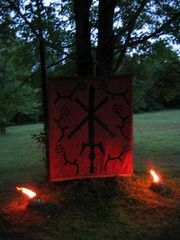 The group met in secret and played a drawn out game of Highlander with wooden dowles, broom handles coated with electrical tape, and even axe handles to represent swords. Many of the players of this game later moved to Akron Ohio and became members of Mirkwood, Avalon, or one or more of the many groups that split from those groups. In the names of people other than Sam that desirve credit are; Moe Misty Cochran, Whitepaws Ryan Murry, Shub John Fellhoelter, Andrew Fidel, Madog. When the freshman of the original group became seniors in high school, one of Shub's friends who is now known as Jikanta talked to him on mIRC and told a tale of a sword fighting group she had just discovered, which was the early stages of Wolfpack or it might have even been Numenor. She directed Shub to the national website, and soon the idea of foam padding weapons to spar with was the way to go. Sometime around August of 1997 their was a sparring session at Shub's house where dap and blue foam was applied to a new type of pvc coated with electical tape weapon that had been an experiment of Madog's Gimpy. That day would be the last day of sparring with broom handles and dowels for many of the close nit group of friends. Rounds of construction soon began amoungst the group. Madog's large back yard and huge pole barn soon became the place to gather. Ample room to fight and avoid parental interferance was probably the main reason amoungst the 16-18 year old kids. Often on Tuesdays and Thursdays everyone would start calling each other and before 4:30 everyone would be at Madog's home to sword fight. Copies of the handbook were printed out and the group quickly changed from Highlander Immortals to a band of Norse Vikings that were at war with Elves of the woods. It was a golden age of enlightenment for those kids. They were free of conflict other than the ones they dreamt up from their imaginations. Battles were often long and their weapons were often huge... and buy huge... Swords were often 6" square on a cross section with layers of open and close cell foam and 3 feet long on the blade with a core that was 2" PVC. Durring this time Garb was a dream that many were realizing was going to be needed but nobody really new how to sew, even thier swords were bare foam and duck tape. As Winter turned into spring, Shub who was attending the Universtity of Akron while completing his Senior year of highschool discovered that Avalon had practices on the university grounds. Madog and Shub showed up for their first outside of Rausumea (although it had no name yet) practice. They brought with them two freshly covered swords of their type of construction. Many times Winfang has said, "I thought that you guys [Madog and Shub] were old veterans returning and that you were going to beat everyone up." A statement which could not have been farther from the truth. Shub and Madog gained a lot of insite as to how larger battles were played out and how to build lighter better weapons with less materials and brought them to the group. Durring that first spring the group started to gear up for and event called Ragnarok XIII which was to be held in southern Ohio. This was the time of the first meeting of the group, Tarquinn, Shub, Madog, and Zrn'norg and a few others met in Madog's Pole barn and decided that the group was officialy going to be a tribe of Vikings going by the name of Rausumea (which the spelling of was not solidly known for another year) and an in prompt to election took place making Madog the chieftain of the tribe. Many of the fighters aquired garb and new Avalon style weapons were constructed. Upon returning from the event, the fighters that attended brought back with them new skill and re-assurance that quickly changed the way everyone fought in combat. The next year was a pretty shaky year, not to much fighting occured amoungst the group. Madog and Shub left for full time collage, Shub to Akron University, and Madog to Pittsburgh. Leaving the group mostly managed from remote. The group continued to fight mostly on weekends when both leaders returned home and durring breaks in the acidemic years. Over the next year's Ragnarok XIV most people who called themselves Rausumeans camped with Angaron a group from Pittsburgh Ohio that Madog was doing work with. Camping with Dun Harrow and Wolfpack, the camp was nicknames Don-Pack-Aron, and many ledgends of the camps mighty tasks completed in battle are still ledgend amounge Rausumeans. Also Shub and Madog were able to show a 2nd place standing in the ledgendary Goat Race. Not long afterwords that August one of the most tragic things to happen to Rausumea occured. Skyn- [Nathaniel Adkins] one of the founding members of Rausumea died suddenly, the morning after a practice, of a massive heart attack that was mostly a result of heart defects that he had. Rausumea still morns the warriors death to this day. Even now Rausumeans call the month of September Skyn in his memory on the Rausumean Calendar. The biggest change that occured between the first and second generation of Rausumea was campouts. And Oh Boy did they camp. Starting with Dragon Basket in March of 2000, Rausumea rocked out campouts every month until October Yg. These gatherings brought friends and family into the fold of what was up until then a group of people who had attended Highshool together. The other major change in the Second Generation was the Av/Venn/Fetteren system. Instituting the Av system transformed Rausumea from a tribe into a Household and the group took on the name The Household of Rausumea. In 2001 after the first year and a half of campouts Rausumea started its first official Wednesday practices at Jump Park. That summer a strong relationship was formed with Rausumea's leadership and the new Queen of Pentwyvern Lady Fay. At Ragnarok XVI Rausumea camped within Pentwyvern's camp. Unfortunatly the relationship saw some tension with some Rausumeans and the following king Richter of Pentwyvern chose to not have any open communication with Rausumea and the shortlived relationship silently died. Rausumea's third generation might actualy be considered one of the most odd times in its history. Rausumea's third generation was when the generation lines were really recognized and drawn out. It really is marked with the changing of the chieftain title to Jarl and the elivating of Shub to Goodi. A lot of things really left the first Generations's grasp and the whole idea of Rausumea started to unfold as well. The Rausumea Guard was formed and role-playing in the Household seemed to almost completely stop on many levels. Eventualy Asher crippled the Rausumea guard when he, at the time General, called for a general resign of the entire group and did not resign himself. This could be marked as the first division in Rausumea, those who resigned and those who did not. Durring this generation campouts began to drag into a complete hault. Mostly a general discust with the regular campsite, Rausumea sought a new campsite. When they found a new one about 90 minutes away from the center of Medina, campout attendance eventualy dropped drasticly and at the end of 2003 campouts stopped marking the end of the third generation. Practices though continued to stay in the 30's for numbers. In December of 2003 Rausumea recieved Voting Rights on the War Council of Belegarth. In February 2004 Ayden Thomas was born the first 4th generation Av of Rausumea, her mother Austinatious Av Rausumea [Julie Monroe Thomas] and father Higlar MacThomas Av Rausumea [Dwight Thomas] were the first Av's to ever reproduce. With the 4th generation starting on a down note with campouts stopping, the Rausumean Guard went into hiding. Rausumea's organization structure underwent a new growth at this time. The Greagis or book of law of Rausumea was officialy voted into effect. The Greagis gave power to the Av's of Rausumea forming an Av Council, and outlining participation, it also created the Domari, Doomer and Megleren positions. The new laws firmly defined the possitions of Jarl and Goodi. Finnaly it outlined how new members would become Venn's and Fetteren of the Household. Despite the new Greagis things in Rausumea slowly got worse lowered attendance at Campouts seemed to infest practice attendance. Soon the regular practice of 20-30 people dropped to under 10. Durring the summer of 2005 new initiatives to bring new fighters and old fighters back were taken. Problems were identified and addressed, and people started to come back. The Lords of Rausumea game was tested and it brought with it dozens of new fighters and handfuls of old fighters back to the ranks of practice. A new found momentum forced its way through the winter and brought back the 30-40 numbers on Rausumea's battlefield. Spring of 2006 started off with a huge increase of participation. As the Lords.Rausumea.com website came up records of practices since August of the 2005 started to get inserted into the online interface. Bank accounts and minted coins started the first round of circulation in the household. Participation by the end of April 06 had increased to new records in the 60's. Coming with it was an influx of Av's Venn's and Fetterens as the Av system really started to see it's full utility with the membership of the household. Rausumea still practices at 5:30pm (regulars try to start a 5:00) on Wednesdays. There are Battles once a month on Saturday at 2:00pm see our scedule on our website for up to date information. http://www.OhioSwordFighting.com Rausumea's PR/new member Portal! This page was last modified on 1 September 2017, at 23:52. This page has been accessed 150,212 times.